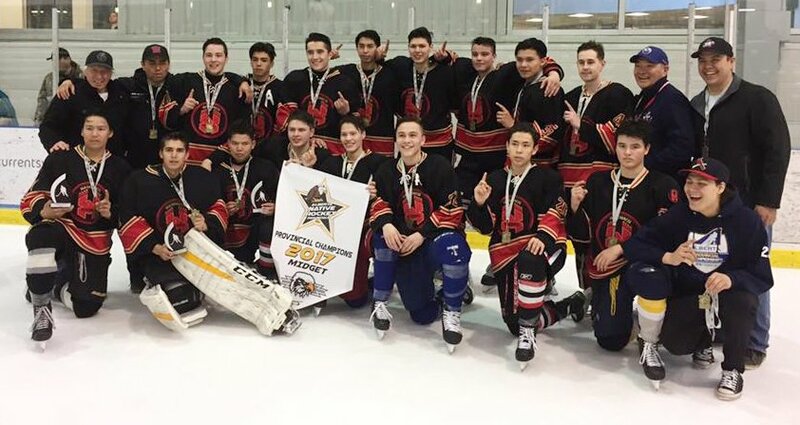 After a pair of runner-up finishes, the Maskwacis Hawks managed to take it one step further and win a provincial championship this year. And the Hawks, a Midget boys’ team, did so in convincing fashion at the Alberta Native Hockey Provincial Championships. The provincial tournament, which attracted more than 250 clubs, was held in Edmonton and concluded on Sunday. The Maskwacis entry blanked a team representing Sturgeon Lake Cree Nation 8-0 in the gold-medal contest. The Hawks were so dominant throughout the tournament that they failed to allow a single goal. They outscored their opponents 30-0 in their four matches. The Maskwacis squad undoubtedly would have scored even more goals, if it wasn’t for a mercy rule that came into play in their opening game. That match, an 11-0 triumph over Grande Prairie, was halted after two periods. The tournament’s mercy rule stipulated games are stopped if one club has a lead of at least 10 goals at the conclusion of the middle period. Members of the Maskwacis squad play for various teams during the season. They didn’t stage any practices together prior to taking part in the provincial tournament. But Hawks’ head coach Steve Wagner had an inkling his side would fare well. “I had a pretty good idea of where the kids are,” he said. Wagner had also coached the Maskwacis side in the Midget category at the provincials the previous two years. A team from Whitefish (Goodfish) Lake First Nation captured the gold medal both times, defeating the Hawks in the final on both occasions. As for this year, the Maskwacis squad was one of six entrants in the tournament’s Midget Eagle Division. This grouping was the highest calibre for those age 15 to 17 that are eligible to compete at the Midget level. The Hawks’ 16-player roster was primarily comprised of AAA and AA players. But the team’s lineup also featured five individuals who played for a squad in the Junior ranks this season. This included three players from the Onion Lake Border Chiefs, a Junior B squad that competes in the North Eastern Alberta Junior B Hockey League. They were goaltender Roddy Ross, defenceman Navarro Lane and forward Tobie Opikokew. Brayden Wells, a defenceman with the Ponoka Stampeders of the Heritage Junior Hockey League, another Junior B circuit, was also on the Maskwacis team. Trekofski began the season with the California-based Fresno Monsters before being dealt to the Arizona Hawks. Though it was a plus to have several players with Junior experience on his roster, Wagner said his squad was not successful just because of them. Another member of the Hawks’ roster, Raine D’Or, who spent a good chunk of the season with the Peace River Royals’ Midget AA team, was selected as the tournament’s most valuable player. Two other Maskwacis players were also singled out for some additional hardware. Ross was chosen as the event’s all-star goalie while Opikokew was picked as one of the all-star forwards. The Hawks’ lineup also included Wagner’s son, Landon Crier-Wagner. For the past two years he’s been in Saskatchewan attending Athol Murray College of Notre Dame and playing Midget hockey for its renowned program. Crier-Wagner said he wasn’t concerned suiting up for a team at the provincials that did not even practice once before playing its first game. Since the Hawks only had four other regular defencemen, Crier-Wagner, who is a forward, volunteered to go back and assist on the blueline at the provincials. He more than held his own and some felt he was even the club’s most consistent defenceman at the tourney. “I ended up liking it, maybe a little bit better than playing forward,” said Crier-Wagner, who had not played defence since his Peewee days, about a half dozen years ago. Though his club did not allow a single goal, Crier-Wagner said the Hawks did have some ups and downs in the tournament. After its lopsided opening win, the Maskwacis club blanked a team from Horse Lake First Nation in its next outing, but by a much closer 3-0 score. “After that we realized we still needed to work hard and push forward,” he said.